A stylish thriller filling a mysterious gap in Agatha Christie's life with a fictional tale inspired by her devious writing, Agatha blossoms into an engaging story of unlikely love emerging from the desolation of depression. It's 1926, and the marriage of famous author Agatha Christie (Vanessa Redgrave) is falling apart. Her husband Colonel Archibald Christie (Timothy Dalton) is having an almost open affair with his secretary Nancy Neele (Celia Gregory), and demands a divorce. Upon learning that Neele is spending a few days at a posh countryside health spa in Harrogate, Agatha checks into the same spa under an assumed identity and without leaving a trace as to her whereabouts. 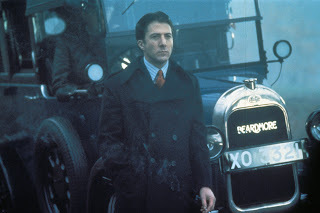 Chasing after Agatha is London-based American reporter Wally Stanton (Dustin Hoffman), and through clever sleuthing he is able to track her down. The two begin a tentative relationship, and Stanton suspects that behind the obvious sadness Agatha is up to something nefarious: she displays a keen interest in the electronic equipment used to power a therapeutic chair at the spa. Despite Agatha and Stanton falling in love, her personal demons drive her towards an act of desperate destruction involving Ms. Neele. The real Agatha Christie did disappear for eleven days in 1926 following the collapse of her marriage, and evidence suggests that did check into a Harrogate spa under a fake name. From there, screenwriters Kathleen Tynan and Arthur Hopcraft take over and construct an elaborate puzzle to fill in the gaps, adding a twist in the tail worthy of Christie's thrillers. Redgrave portrays Agatha as utterly haunted by the failure of her personal life, rendering her professional success meaningless. Redgrave effectively conveys a mixture of detachment, despair and manipulation, Agatha allowing her mind to construct a solution to her personal problems using the methods of her fictional thrillers. In a turning of the tables, Hoffman slightly overplays the role of the suave American reporter, neither the nationality nor the profession being particularly well known for the height of sophistication. 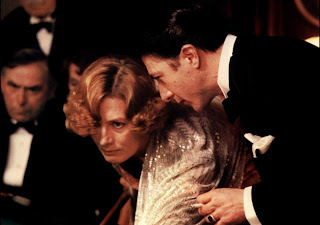 Nevertheless, Hoffman remains steely eyed in his determination to find Christie and then win her heart, and he demonstrates a deft touch with the ever-present cigarette, and more impressively, cigarette smoke. The height difference between Hoffman (5' 5") and Redgrave (5' 11" plus heels) is unfortunately awkward. She towers over him in a few scenes, stripping away some of the authority that Stanton is supposed to project. Director Michael Apted is in his element confidently steering a character-driven mystery to its conclusion, the efficient running length of under 100 minutes ensuring a welcome nimbleness of execution. Apted and cinematographer Vittoro Storaro bathe Agatha in luxurious pale greys, browns and blues, creating the impression of a gracefully aged sepia toned picture befitting the exuberant 1920s setting. Agatha is engaging without being completely immersive, the movie a good metaphor for Christie's books: clever and entertaining, but perhaps just lacking the necessary depth to brush perfection.